Some people like to put fake sugar, butter substitutes and other weird stuff in their food to keep it light. I prefer to simply use a little creativity. Red bell peppers become incredibly creamy and decadent after being roasted and pureed with garlic, onions and just a smidgen of half-and-half. I added shredded carrots, fresh corn and tomatoes because that’s what I had in my vegetable bin, but feel free to use spinach, broccoli, mushrooms, eggplant—whatever you have on hand. I like to leave the veggies raw, letting the heat of the pasta and sauce gently “cook” them. If you prefer softer veggies, feel free to blanch them before adding them to the pasta. 1/8 cup half-and-half $1.50 for 1 oz. 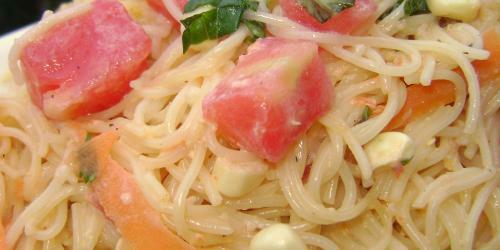 Cook capellini in boiling water according to directions. Drain and set aside. While capellini cooks, roast the red pepper, either over a flame on a gas burner or under a broiler in the oven. Hold pepper (using tongs, or a baking pan if using a broiler), directly over (or under) the flame, rotating periodically, until its skin is completely blackened. Rinse pepper under cool water and peel away the blackened skin, revealing a very soft, silky pepper. Remove stem and seeds. Chop pepper into small pieces. Heat olive oil in a small pot over medium heat. Add onion and garlic and cook just until fragrant, 1-2 minutes. Add red pepper, half-and-half, and 3 tbsp water. Cook until liquid begins to bubble, 2-3 minutes. Remove from heat. Puree pepper mixture, using a blender, food processor or immersion blender until smooth. Toss pasta with red pepper sauce, vegetables, and basil. Season with salt and pepper. this sounds amazing. but is there anyway to make it without a food processor?? your site is amazing btw! I stumbled upon your site and when I read the name of it I actually busted out laughing! Seriously awesome. I can’t wait to try some of these recipes! Tried this last week, really liked it. Being Italian, I usually make heavier sauces, but this was a nice change, really nice flavors!!! this sounds amazing. but is there anyway to make it without a food processor?? I used to consider your article and considered in the event that you had contemplated building up an automated book stuck in a shocking circumstance. Your creation would push it advantageous. you have a disaster area of making a limit.